Location: 64-70 W. Monroe St. The Montauk Building was the first major commercial building developed by the architectural firm of Burnham & Root. It was built o the site of the Chicago Museum. The Montauk Building, at 115 Monroe Street, has a frontage of 90 feet (27 m) and a depth of 180 feet (55 m). It is 130 feet (40 m) high, in 10 stories, of steel construction, on heavy foundations, with thick walls. It has 150 offices, 300 occupants, and 2 passenger elevators. Erected in 1882, at a cost of $325,000; considered the first tall steel building (skyscraper) in Chicago. It has resisted two hot fires on its western wall. Here Burnham & Root, the architects, had their offices while they built the Rookery. The First National Bank has made peace with the last of the tailor tenants in the Montauk block, and the work of tearing down the building, to make way for the first section of the bank’s proposed policy $3,000,000 building, will be begun immediately. No definite date is set for the completion of the section occupied by the Montauk, but it is hoped to have it finished by May of next year, when the bank will move in and the work of tearing down its present building, at the corner of Dearborn and Madison, will be commenced. D. H. Burnham & Co., who have prepared all the plans, will hasten the work as much as possible. The exterior of the new building will be of granite, the exact hue not having yet been decided upon, but it will either be of gray or yellow shade. Some of the contracts have already been awarded. From 1903-1965, the First National Bank Building occupied the site. In 1965, this was demolished to make way for First National Plaza (now called Chase Tower). the weight units entering into the superstructure. In no other city, perhaps, in America, has the question of foundation received so much careful consideration from engineers as right here in Chicago, on account of the nature of the sub-strata underlying the surface, upon which the weight of the structure must be proportionately distributed. The necessity for a system of floor construction that was light and strong arose just about the time that the high building era set in, and the hollow tile method was adopted as soon as presented, in order to reduce as much as possible the superimposed load on the foundations of walls and columns. 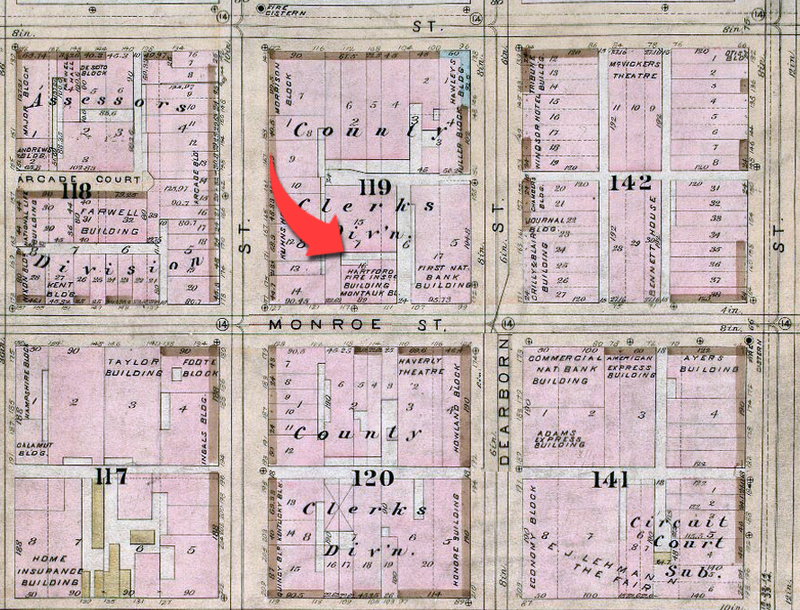 About twenty-four years ago, the Montauk Block was erected on Monroe street, from plans prepared by D. H. Burnham & Company, architects of this city. The foundations of this structure were rubble stone; the exterior walls of the building solid masonry, of varying thicknesses, as called for by the building ordinances then in force. 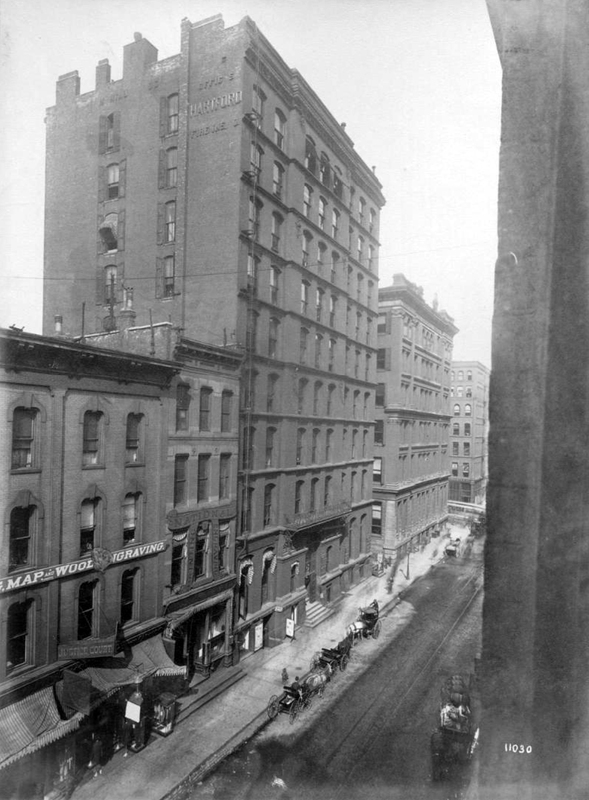 This building was nine stories in height, and was considered at the time a “skyscraper.” Within a very recent period, this structure has been razed to make place for an eighteen- story modern steel skyscraper for the First National Bank. When the plans were drawn for the Montauk Block, a great many different systems of fireproof floor construction were considered, to wit Brick arches, corrugated iron arches, filled in with concrete; solid concrete arches; Lime of Teil blocks and hollow tile arches. 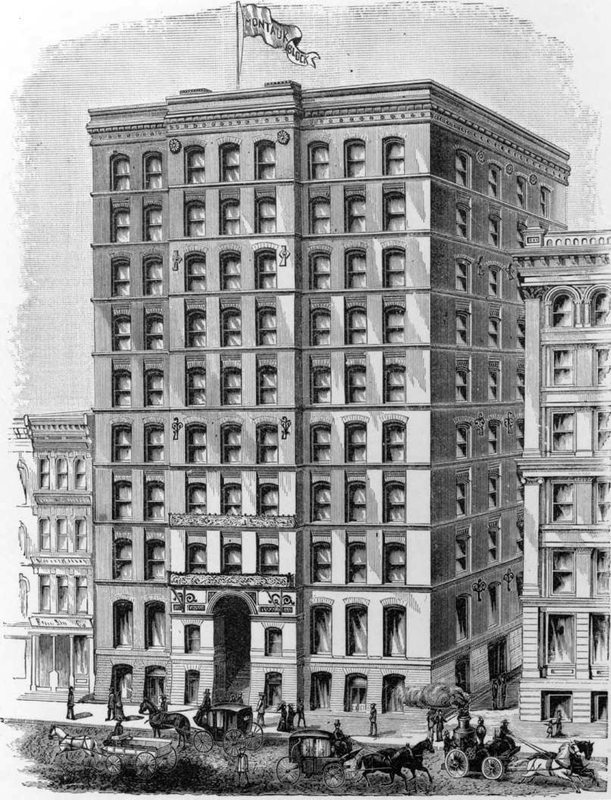 As this was the first nine-story structure ever built, and higher than any other business building in Chicago, the merits and demerits of the different systems were carefully considered, and hollow tile arches were accepted for the floors of this building, for the reason that by the use of tile arches, the required vertical and horizontal strength was secured at a minimum dead weight of floor construction. The tile arches in this building were what is known as side “construction” arches; the soffits of the beams being covered with i-inch slabs of fire clay tile. The spans between the beams, as I remember them, were about 5 feet, 6 inches. The beams were about 9 inches in depth, framed into girders, supported at intervals on cast iron columns. I refer to this building particularly as I believe this was the first high building that proved a financial success to its owners, thereby stimulating the erection of similar structures, which has culminated in the present up-to-date thirty-story steel skyscraper. The standard of construction adopted in the Montauk Building, for floors, is practically the standard of floor construction now in most general use for the erection of fireproof buildings. There are in use at this date, throughout the United States, in various buildings, embracing every description, from private dwellings to wholesale warehouses, over 200,000,000 square feet of standard tile constructed floor, equivalent to an area of almost 5,000 acres of floor surface.